Throughout the imperial period, two Roman legions were based at Zeugma, increasing its strategic value and adding to its cosmopolitan culture. 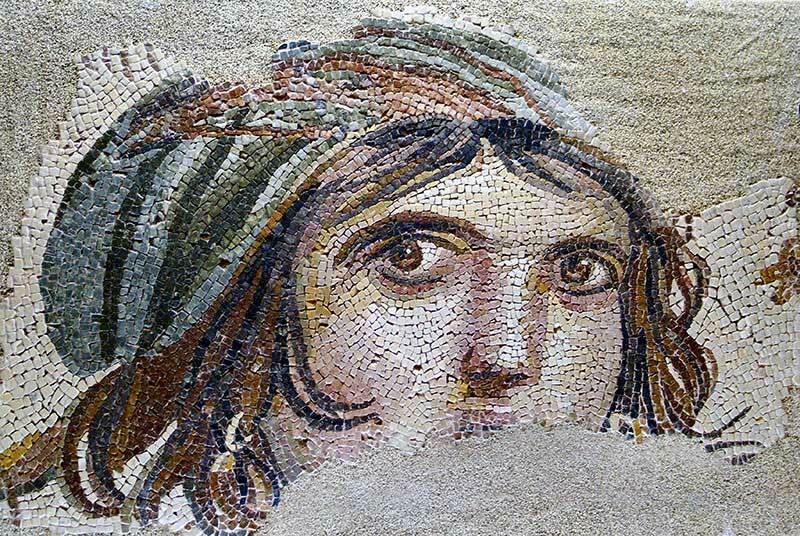 Due to the high volume of road traffic and its geographic position, Zeugma became a collection point for road tolls. Political and trade routes converged here and the city was the last stop in the Greco-Roman world before crossing over to the Persian Empire. For hundreds of years Zeugma prospered as a major commercial city as well as a military and religious center, eventually reaching its peak population of about 20,000-30,000 inhabitants. During the imperial period, Zeugma became the empire’s largest, and most strategically and economically important, eastern border city. According to Gorkay, the mosaics were an important part of a house’s mood, and their function went far beyond the strictly decorative. Many of the mosaics were selected according to a room’s function. For example, bedrooms sometimes featured lovers’ stories, such as that of Eros and Telete. The choice of images in the mosaics also reflected the owner’s taste and intellectual interests. “They were a product of the patron’s imagination. It wasn’t like simply choosing from a catalog. They thought of specific scenes in order to make a specific impression,” he explains. “For example, if you were of the intellectual level to discuss literature, then you might select a scene like the three muses,” Gorkay says. The muses were thought to be the inspirations for literature, science, and the arts. “They are also a personification of good times. When people drank near this mosaic, the muses were always there, accompanying them for atmosphere,” he says. Other popular themes in these reception and dining areas were love, wine, and the god Dionysus. However, it was not only subject matter that was important in choosing the mosaics. It was also their placement. “In a dining room off a courtyard, the couches on which people were sitting or lying, drinking, and having parties were positioned around the mosaics so people could see them, as well as the courtyard and pool,” Gorkay says. He also explains that there was an order in which the mosaics were intended to be viewed. When guests first entered the house, there was a salutory mosaic positioned to make an impression on people coming through the doorway. This mosaic might give introductory hints to the guests about the favorite subjects, taste, or themes of the host. In the next room, they were invited to recline on couches in order to view other mosaics. After the guests were seated, the convivium, or feast, would begin. Currently Gorkay and his team of 25 students are excavating two first-century A.D. houses about 300 feet from the area under the shelter, where work has been completed. Here the team will learn more about the private lives of Zeugma’s former residents. For every room of each house being excavated, there is always the hope of a fantastic mosaic waiting for them when they reach the floor level. The team also hopes to find examples of graffiti, a term archaeologists use to mean any images or text written on a building’s wall. Graffiti can be an important type of evidence in determining the religion, profession, or ethnicity of a house’s inhabitants. For example, in Zeugma, a painted or scratched-on name could determine whether an inhabitant was Semitic, Persian, Greek, or Roman. Gorkay has also supervised preliminary studies in the Hellenistic agora, the commercial and administrative center of the city, some 100 yards away from the shelter. As yet there has been little excavation there, but Gorkay hopes that future digging will reveal more about Zeugma’s civic identity. In 2000, a team excavating a market building in the agora uncovered an archive room containing tens of thousands of official seals, giving previously unknown details about the administration of the military and trading center. Other excavations across the site have yielded several bronze statues, thousands of coins, and hundreds of pounds of ceramics. When they are catalogued and studied, these too will reveal valuable information about the city’s residents, their customs, and the types of goods being used and traded there. There is also much yet to learn about the practice of religion in Zeugma. Through further excavation, Gorkay wants to examine the place of politics and nationality in the practice of religion during the transformative periods in Zeugma’s history. In 2008, atop the Belkis Tepe, archaeologists excavated a temple and sanctuary where three colossal cult statues of Zeus, Athena, and probably Hera, were found, marking it as one of the city’s most important religious sites. But there are still many questions left to answer about the ways in which the traditional Greco-Roman gods were worshipped alongside the Persian deities who were also honored in the city. Similarly, says Gorkay, “In the time of the Commagene rulers, Antiochus I consecrated many sanctuaries and depicted himself in all of them,” including stelae on which the king is shown shaking hands with gods. But during the Roman period, these temples were stripped of their political character and the gods were portrayed alone, signifying a change in the cult dedicated to the worship of the ruler. In the future, Gorkay hopes to continue to explore the civic, sacred, and private identities of the city, and to focus his excavations on the sanctuaries, civic buildings, houses, and necropolises that give Zeugma its cosmopolitan character. While many of the mysteries of this ancient city will remain forever sealed under the waters of the Euphrates, Gorkay is convinced that Zeugma has only started to tell its story.